I had no idea that my baby would be born with a rare cranio facial condition. Essentially, the left hand side of this face never formed and he was born with no eye, eye socket, nostril or ear. 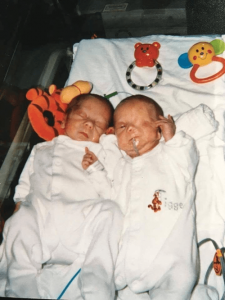 Despite being a twin and having lots of scans, his syndrome was never detected so to say I was stunned is an understatement and I struggled for a while to forgive myself for something which actually was never my fault. Over the years Harry has had extensive reconstructive surgery to correct what mother nature omitted and I have become passionate about raising awareness that people who may look different are still as important and precious as anyone else. So, when I saw ‘Everybody’s Different: The Appearance Game’ mentioned on Twitter I was keen to find out more. 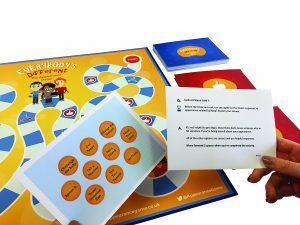 The board game has been created by Focus Games, who pride themselves on developing bespoke games that address specific medical issues as well as sensitive social issues such as appearance. They developed the game in partnership with academics at the Centre for Appearance Research, who focus on the role of appearance and body image in people’s lives. 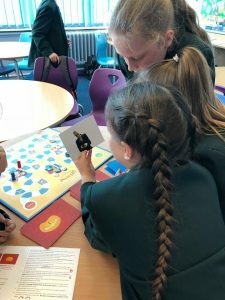 The idea of playing a game with children to develop their understanding of issues like visible differences really excited me as it felt like a natural extension to my own assemblies as part of my charity More Than a Face and as a teacher myself I could see it being used as part of awareness days and PHSCE sessions. Focus Games and I decided to collaborate and so I went into a local school to play the game with a group of year 5 pupils and get their feedback. As a teacher I know too well that sometimes, the best lesson plans on paper can fall flat in the reality of the classroom so I was interested to know whether the game would be as well received as I hoped. The game itself is played by two teams (my pupils opted for a boy / girl split) of any number although I think 3 – 5 in a team is probably about right. The aim of the game is to progress round the path on the board with the first one reaching the end being the winner – a simple concept. Other cards use visual prompts with images to discuss such as “why do you think this lady has this appearance?” and some encourage pupils to realise that actually, appearance tells us nothing about the person (which I love as it fits so well with my own views and charity aims.) Suggested answers are given and points are awarded if pupils give sensible answers. 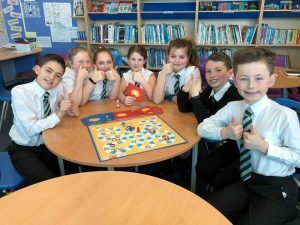 There are no wrong answers and pupils only move backwards on the board if they happen to land on a square with that instruction – which the other team always love! 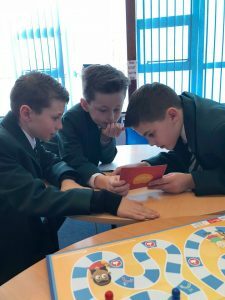 It was fascinating to see the children open up in their thinking and their answers as the game progressed and at times, challenge each other’s thinking. For example, one question asked if a person’s appearance made a difference to how well they could perform their job. Instantly everyone said “No, it shouldn’t matter” but then, and with very little intervention from me, they started to talk about attributes that are important for certain roles – a smart business man who wants to be taken seriously, a strong fire fighter who people will depend on in an emergency. I loved watching them discuss with each other the various tasks and change their opinions in a constructive and positive way. The game took us about 40 minutes to complete. It can be played quicker if two dice are used but I really wanted the pupils to answer as many questions as they could to be able to give me an informed opinion. 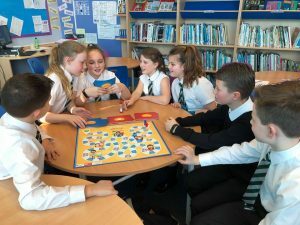 When I asked the pupils if they thought it was a game that other pupils should play they answered with a resounding “YES!” and I have to agree. Although, as with everything, on its own I don’t think it can completely inform and change opinion, it is an essential tool for prompting conversation on topics which might otherwise not be addressed. I’d love to know what you think of the concept! I think this game sounds like a great idea and hopefully will be rolled out across most schools to raise awareness. What a fantastic idea for a game. I’ll definitely be seeking this one out. Glad to see such positive opinions on our game, it’s available at http://appearancegame.com/ and we hope you will love it! I love the idea of this, it would be brilliant for my pupils. I think we need to invest in a copy for school. Lovely looking game and definitely should be seen more in schools. I love playing games with the kids and talking about something other than Paw Patrol! What a lovely, clever idea! Great idea, as we all should be accepting of one another :- Whether we look alike, or different. As we are not all the same, we need to be accepting of differences, as well as similarities. Sometimes knowledge can prepare children and adults to be accepting and considerate and courteous. Respect, patience, etc may need to be developed. Knowledge can assist understanding. Board game likely to encourage Community Spirit, etc. I think its a great idea! Perfect way to start up a sensitive subject for some. This is such a lovely idea for a game, I’d love to see this used in schools! Looks an interesting and informative game for all! Great idea. My son gets comments about his elf ears! Such a great idea – especially around the age kids become more aware of differences. But adults should play this too as they would learn something – kids follow their parents’ example. i think its a wonderful idea to help to encourage children to understand that everyone has different characteristics but at the same time we are all the same and should be treat that way too! Fab Idea! It sounds like fantastic idea. I agree, board games are great at teaching patience, world-knowledge and tactics! we love playing Risk for just that problem-solving learning experience! In a word, it is fantastic. So many people smugly declare that they do not have prejudice against certain well publicised groups while continuing to display both overt and covert prejudice against other, less well known groups. I applaud anything that breaks down these barriers. Thanks susan for these great comments, you can get the game at http://www.appearancegame.com if you are interested! I think this game sounds like a good idea and will help children to build on their self confidence. I have just come across this, and I’m so glad I have, I’m also very passionate about this, I’m a paramedic and I work tirelessly explaining to my own children about how everyone is different, I see so many different people everyday that I always explain to my children that we never ever treat anyone differently. I’m so glad I found this site. I’m not sure about this game. I’d like to know more about it. Discussing appearance is a positive thing, but as long as it’s done in a positive way. I think its a great idea and must help some children. Thanks for the competition..
It’s a brilliant idea! My niece has cerebellar ataxia, and therefore has speech impairment, is in a wheelchair, and has to push herself around on her bum because, in simple terms, her brain can’t send the messages to her legs to walk. It is important to promote the message that although we look different, we are all the same but unique. 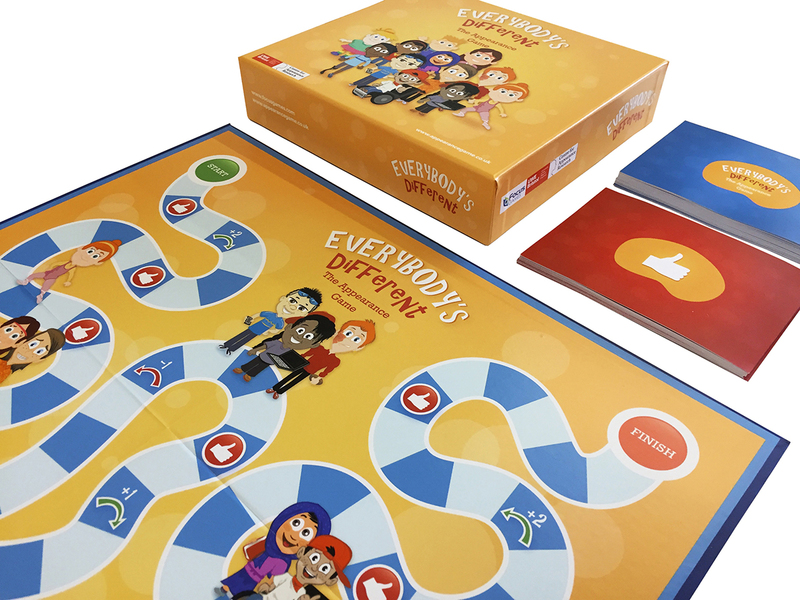 This amazing game could help tackle bullying. My son was bullied in school for being slightly different. A game like this might change his classmates’ attitudes and my kid wouldn’t have to go through the ordeal of being bullied. I think it’s a great idea to let young people know that it’s actually OK to talk about appearances, so long as you approach it in the right way. Firstly I want to say that Harry was then & i’m sure is now beautiful! I know you want the best for your angels & the game is fab & the children’s comments were so meaningful! We all need to be more concerned with the beauty on the inside & I always tell my girls they are kind beautiful girls. Kind comes first as I think it’s the most important quality for us all. This game gives me hope for a less looks obsessed future. I think it’s great,my niece was born with only 1 ear and although she’s perfectly happy with it,there is the odd time when she gets bullied by another child.